Bette Jane Owen Allen, 91, of Whispering Pines passed away peacefully on Saturday, Feb 9, at Moore Regional Hospital. Bette was born in Arlington, Virginia, in 1927 to George and Nora Owen and raised there as a child, later moving to Durham, NC, as a teenager and graduating from Durham High School in 1944. Bette and her husband Joe raised four children in Durham and Cary, NC. Their home was often a gathering place for her children and their friends, whom she treated as her own. Following retirement, she settled in Whispering Pines in 1997. 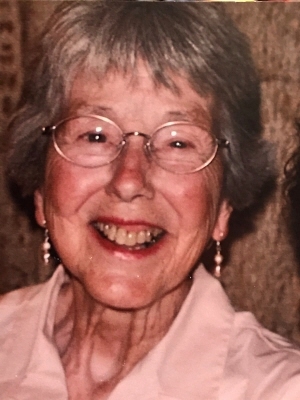 She was an active volunteer who delivered flowers at Moore Regional Hospital and worked at the Whispering Pines Thrift Shop for many years until her health declined. She loved cooking, sewing, gardening, bird-watching, politics and reading. Although mostly home bound in her later years, she continued to grow and enjoy flowers, often giving them as gifts to friends, neighbors, and Meals-on-Wheels volunteers. Her favorites were African violets. She is survived by her sister, Barbara Owen Carpenter and brother Thomas Michael Owen and her beloved four children: Joseph Carr Allen and wife Suzy of Buffalo, New York; George L. (Larry) Allen and wife Christie of Whispering Pines; Jane Allen Beaman and husband Joseph of Mt. Olive; and Nancy Allen Waller and husband Randy of Cary. She was the proud grandmother of six grandchildren - Zachary Petersen, Carrie Allen, Rev. Allen Waller, Jessie Edwards, Lee Allen, Nicklaus Edwards and four great grandchildren. She was preceded in death by her parents, her husband of 48 years Joseph Carr Allen, Jr, and siblings Philip, Bruce, and George Owen. Bette was an active member of First Presbyterian Church of Carthage until her health prevented her from attending regularly. A memorial service and reception will be held at the church on Friday, February 15, at 11 am with the Reverend Rick Martindale officiating and remarks by Reverend Allen Waller and Reverend David Beck. In lieu of flowers, memorials may be made to First Presbyterian Church of Carthage, 110 South Ray Street, Carthage, NC 28327. Services have been entrusted to Boles Funeral Home of Southern Pines. To send flowers or a remembrance gift to the family of Bette Jane Allen, please visit our Tribute Store. "Email Address" would like to share the life celebration of Bette Jane Allen. Click on the "link" to go to share a favorite memory or leave a condolence message for the family.